Written by: Bronwen Collins | November 7, 2018. This season marks the beginning of a new Diesel wardrobe. The masters of denim have you ready for winter with eye-catching jumpers, jeans and t-shirts in a fantastic range of colours and cuts. With references to 90’s subculture and blends of youth, these outfits carry a powerful statement. 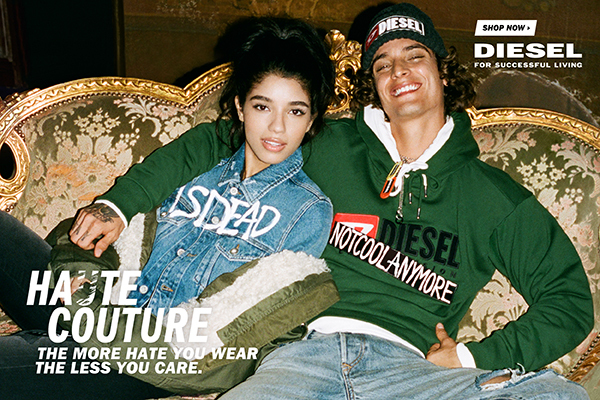 Diesel Haute Couture collection features bright hoodies and jumpers with bold logo printing providing impact making fashion. Large padded jackets and brightly coloured hats bring back an omen to the 90s’ and abstract patterns, leaving you looking fresh and fun despite the gloomier weather. Shop the AW18 collection on Mainline Menswear today, from Haute Couture hoodies to Diesel T Just Gyp shirts.